Drift pin are used in a variety of applications including: marine projects, bridge work, highway projects, and wood construction. Headed barrier pins are also available, made to state specifications. Call Portland Bolt today for more information. Portland Bolt has the ability to manufacture un-threaded pins to your specifications. 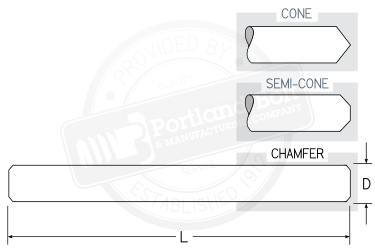 Portland Bolt inventories round bar from 1/2″ to 2-3/4″, with over 20 different grades available. All operations, including the galvanizing process, are performed in-house. Certification is provided with drift pins and specification stamping is done in compliance with ASTM and AASHTO.